It may have a funny name, but this revolutionary set of cooking tools is one of the best available. The unique design looks way different than the tongs or spatula you are using now, but this pork inspired shape actually increases speed and accuracy, while reducing damage when cooking food on your grill. This two piece set will quickly become your favorite option as it replaces the pokers, forks, flippers and turners you are currently annoyed with. Instead of squashing your steaks or getting frustrated as hot dogs roll around, you will be able to quickly turn and maneuver your meat to perfection. Use either one indoors or out to turn, flip, move and carry food safely and easily. The end of each Pig Tail Flipper is tapered with a sharp, spiral snare that allows you to lightly pierce any food to flip or move it without trouble. You never squeeze out juices and marinade, and you never push stuff around and smash it into the side of your barbecue. A quick flip of your wrist is all that it takes to turn food over, and the versatile design can handle almost anything. Use it outside to turn racks of ribs, hot dogs, veggies, steaks, burgers, chops or chicken, or take it inside to turn bacon, move baked potatoes, flip french toast and more. Comfortable handles keep your hand cool while cooking, and an ample reach keeps you at a safe distance from the heat. This is the two piece set, and it contains one of each size flipper. 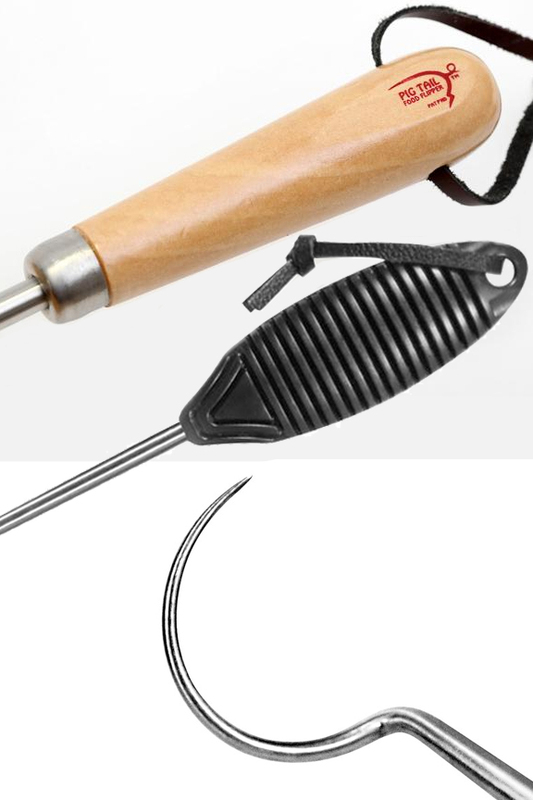 If you only want one or the other, then we also sell them individually here: Large Pig Tail Food Flipper & Small Pig Tail Food Flipper. Giving them as a gift? Check out the Box Set for the same tools presented in a wooden gift/storage box. Originally only available with the classic, wood handle, you now have the option of ordering this powerful set of tools with high quality ABS plastic handles instead. The wood version is the original, so many people will always prefer the rugged, natural look, but the plastic version may be preferred by certain individuals. When you get the plastic ones, the grip is a bit wider, and the material is easier to clean because it's dishwasher safe. Both types will stay cool to the touch while you cook, and both are ergonomically shaped for comfort. The wood ones do cost a bit more due to the raw material costs, so if you don't care about the look, and want to pay the lowest price, plastic is probably the choice for you. Both sets are from the same manufacturer, and the only difference is in the handle material. These are the original tool, and the overall quality is far superior to similar looking alternatives. 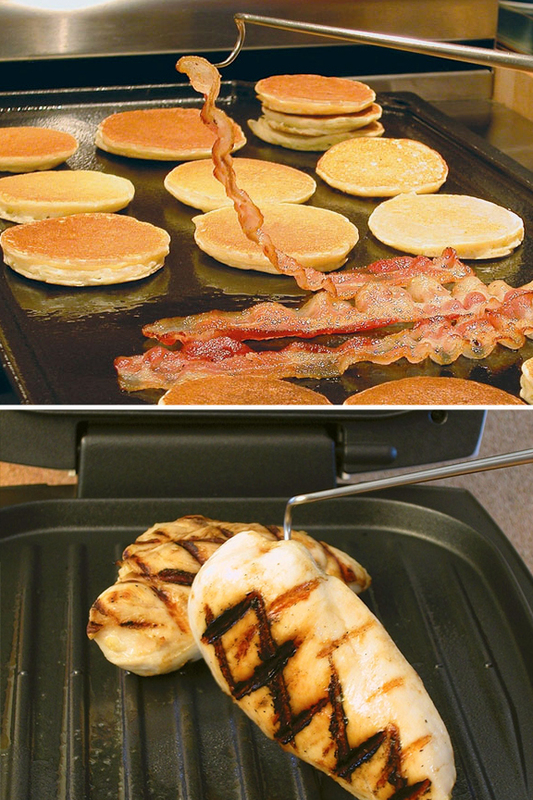 No scraping up grease using a spatula or getting frustrated when food slips out of your tongs. Switch to this set of tools and you will wonder how you ever got along without them. It doesn't matter what size or shape the food is, or what type of marinade or sauce you may have on it. Because of the unique design of these flippers, you will be able to avoid common annoyances while cooking or grilling. It is ideal for any kind of meat, but also works for other foods like corn on the cob and grilled cheese. Anything you turn, flip or rotate while cooking is fair game when using this set. Tongs force you to squeeze food too hard, and it often slips out when you loosen your grip. Forks leave large holes, and will often require you to make several attempts to turn your food. When using a spatula, the applications are limited, and it is common to struggle with slipping it under you meat. The Pig Tail’s hook and shaft are made of surgical-grade stainless-steel for strength and durability and the hook will not leave marks in your meat or cause them to bleed. When you grab a piece of food, it will hold secure, but then release easily with a slight technique. You never smear off sauce, or squish out flavor, and you won't get frustrated while trying to pick up your food. Flipping and moving food is made simple when you use one of these. A similar technique will work on all sorts of foods, so modify slightly depending upon what's for dinner. 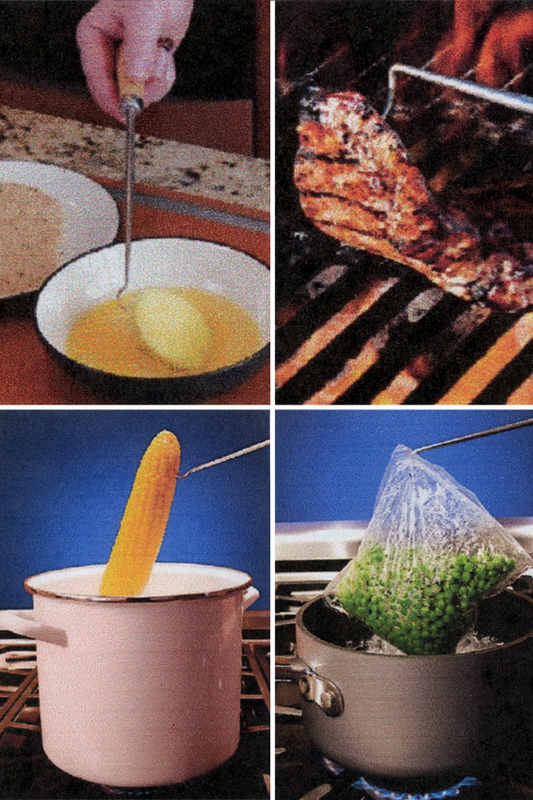 Anytime you need to move, position, rotate or flip food over a hot surface, use these to do it faster and more safely. Choose the flipper you will use. Longer is generally better outside, and shorter usually works best at the stove. To grip food for flipping, use a continuous wrist turning action to pierce and turn at the same time. Scoop it up and flip it over with a single action and never worry about getting underneath. To grab meat and move it, simply poke lightly, apply pressure and then push or pull to place it. To release food, use a reverse action to back out. The same quick wrist turning action will slip it out, and cause food to remain in place. When inserted the sharp coil will hold tight. Use to flip transport, push, pull or turn. Stainless steel prevents sticking and washes clean easily after you finish. Hand wash for increased longevity. This set ships with two Pig Tails - a 19-inch tool that's great for outdoor cooking, and a shorter 12-inch model that is ideal for stove top grilling or sauteing. Both Pig Tails have wood handles for a cool grip, leather cords for hanging near the grill or stove and are covered by a lifetime replacement guarantee. Use either one indoors or out because it will really come down to preference, as to which one gets used most where. Because of the long reach offered by the 19" size it is better suited for using at the grill in your backyard. It will keep you far enough away from the flame to be comfortable, but allow you to get in quickly and do all of your turning without letting out all of the heat. Because the smaller sized flipper puts you a little bit closer to the food, most people like to use it in the kitchen. As a kitchen utensil the Pig Tail is incredibly useful and efficient. You can turn and flip many kinds of food without switching tools, and you are able to flip quicker and easier because it grabs so well, but doesn't hold on too tight. This set of tools will increase speed, decrease messes, and allow you to have an easier time preparing food. There is a bit of a technique involved, but after one or two uses, anyone will be cooking like a pro, and looking like one too. Order Yours Today! Pig Tail Food Flipper - The easiest way to cook on the grill. Fast easy and safe. This unique tool is great for both indoor and outdoor cooking. Comes with a lifetime guarantee. A great tool and great gift. We use the pig tail flippers to put meat on the grill or turn it. The small one, we use to handle raw meat, breading, turning meat on stove top or from oven. BIL is an avid griller and experimental cook. We got a set of pig tail flippers as a gift. A utensil you use once and you wonder why didn't I think of this. We use the smaller one in the house and the longer one on the grill outside. We just love them and would definitly recommend them. Couldn't get the star boxes to work if they are suppose to. But I would give it 5 stars. Love them! Great for flipping steaks on the grill. Long handle keeps hands away from fire. 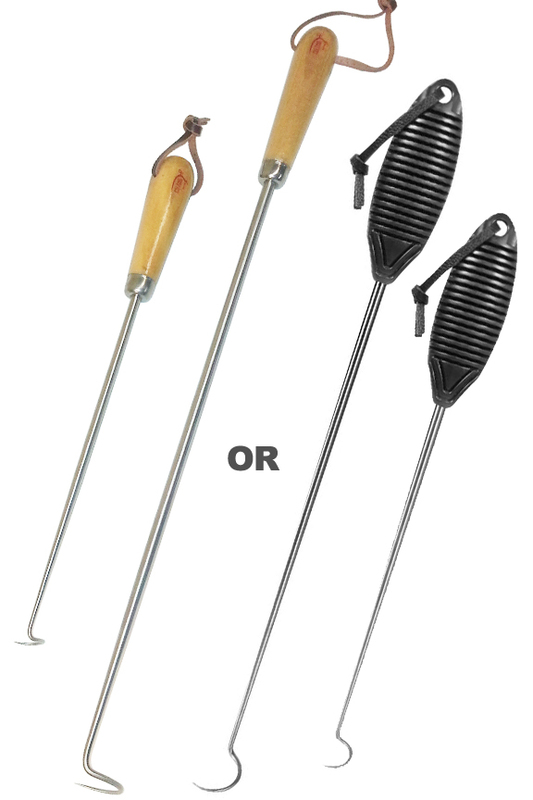 The 2 pig tail flippers are great for steaks, ribs, chicken or any other solid meat you grill. They are well made! The pig tails are great when you cook out on the grill! They are great for flipping meat. This is the best utensil for cooking meat. This is one of the handiest tools in the kitchen. I also use the larger one outside for the grill. The smaller one I use almost daily and really find it handy. If you have never tried these tools to cook with this is a must have. I was introduced to them 5 years ago and have order another set for camping. They are great for the grill with the longer reach and are easy to keep clean. Enjoy your new pigtails! I recieved my purchas, which were for my brother's and they we're very happy with them. Thank you so very much. A must have for the gril !!!!! Actually purchased these flippers as gifts for my son & son-in-law. I have had one for two years and find it fantastic. It flips ribs, steaks, chicken, pork chops and lamb with ease and allows one to reposition the meat quite easily once flipped...merely stick the pigtail in a corner of the meat and slide it wherever it needs to be placed. I do not have the shorter pig tail and question how well it would work on a full grill. A chef's hand could be exposed to some heat as he reaches for meat at the rear areas of the grill. Bought these as gifts for all my grilling friends. Everyone has mentioned how useful they are. Highly recommend. Fast shipping even to Hawaii. Would order from here again. I already had a set for my self.This was a gift for my brother.He loves them. This is the best utensil. Use the big one on the grill and keep the small one in the house. I have given them as gifts and everyone loves them. This is my second flipper. My first one just disappeared and my kitchen immediately went on lockdown until I could find this replacement . It is very difficult to find the left hand orientation so I was very happy to find this product again. I use this flipper several times a week, both outside grilling and the kitchen flipping all sorts of meats. Works really well and I will always have one on hand!!! These things are so awesome and easy to use. 10 times better than forks or spatulas.Great company to do business with no hassles just good business.I will recommend this co. to my friends. wish all my gifts were such a hit. not only clever , but works great. packaging was a little "grocery store" looking but the men didn't care. I bought one from a vendor about a yr ago. Its really easy to use for any meat. The trick to steaks is to barely poke it. Just ordered another set for my dad bc he used it while he was at my house and loved it. I purchased one of these a few years back and my husband absolutely loves it :-) He's left handed and it's so easy to use and works perfectly!!! I recently bought 2 more for gifts for two of my bosses (both are lefties also)They both thought they were so cool... Thanks for haveing a great quality item. They actually come with a little rubber cover for the tip. It slips on to conceal the sharp part, and makes storage simple. ordered above, no rubber tip received with item. can you help? It may be hard to see, but the tips are in the packaging. They will not be on the pointy end of the flippers, but they will be included inside the clear plastic blister pack. Look very carefully from the top and you can see them without opening the package. Where is this pigtail made? This is the original product. They are currently made in China. Do these have the wood handles? You will have the choice of wood or plastic handles when you add the item to the cart.